Position probe at cardiac apex looking up towards the patients R shoulder and with the marker pointing between the L shoulder and flank. Rotating clockwise from the L shoulder will open up the heart bringing the R side into view. Volume of LVd and s, RVd and s, LAs and RAs by Simpsons method (trace around inside chamber and measure length). Ignore papillary muscle. Basal and mid width RV and length of RV. MAPSE at lateral MV annulus. TAPSE at lateral TV annulus. Vena contracta should be measured in PLAX if possible. TV inflow and regurg. PISA. PV S and D velocity. Peak Em, Am, Sm and E/Em ratio. Can substitute ‘prime’ for ‘m’. Angle the probe slightly anteriorly and the LVOT and aorta will come into view. Measure Vmax from which the gradient can be calculated by the simplified Bernoulli equation. If Vmax LVOT (PW) >1m/s or aorta (CW) <3m/s then need to use full Bernoulli for which you need LVOT VTI from PW as well as aortic VTI from CW. Trace round doppler envelope below line to calculate mean pressure gradient (this is the VTI of the aorta). Machine should automatically measure Vmax from a VTI measurement so don’t need to measure Vmax separately. If regurg above line, measure pressure half time (downward slope of line). Position in LVOT where measured LVOT in PLAX. 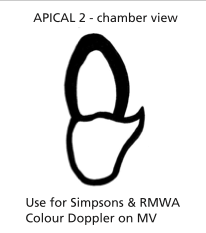 Trace around doppler envelope to get VTI for SV and accurate valve area calculations. Freeze the trace and measure time between end of aortic outflow and start of mitral inflow - this is the isovolumetric relaxation time (IVRT) used to assess diastolic function. Note BSEs minimum data set says to do this with CW doppler. From the A4C view rotate the probe anticlockwise so the marker points at the patient’s L shoulder. The R side will disappear leaving a view of only the left side. Measure LV area and length (volume) in systole and diastole for EF. Measure LA area and length. Rotate the probe 90 anticlockwise so the marker points at the R shoulder. The LVOT and aorta will come into view. Colour and doppler for more info on MV and AV. 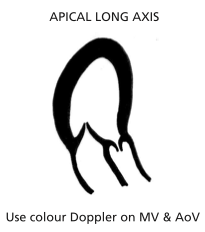 This is good view to assess AV peak velocity if you haven’t been able to get a good A5C view.